New, disturbing information is emerging about Big Pharma’s role in the nation’s killer crisis with the abuse of prescription opioid drugs. It also shows that, even when companies act in ways beneficial to the public good, they do so with self-justifying spin. Major kudos, to start, to the Los Angeles Times for its sustained reporting on the questionable activities of Purdue Pharma, maker of OxyContin, one of the nation’s best-selling and most abused opioid pain-killers. Purdue, for marketing purposes, worked with firms nationwide to obtain detailed information about the distribution and sales of OxyContin, a Times investigation found. Company executives, at one point, turned to this data as part of what it would tout as a top-level initiative to crack down on abuse and criminal activity involving a product that has generated $31 billion for the private, family-held firm. 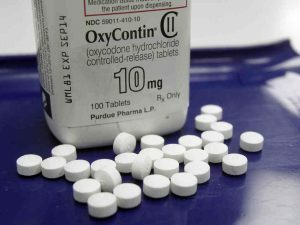 [F]or more than a decade, Purdue collected extensive evidence suggesting illegal trafficking of OxyContin and, in many cases, did not share it with law enforcement or cut off the flow of pills. A former Purdue executive, who monitored pharmacies for criminal activity, acknowledged that even when the company had evidence pharmacies were colluding with drug dealers, it did not stop supplying distributors selling to those stores. Purdue knew about many suspicious doctors and pharmacies from prescribing records, pharmacy orders, field reports from sales representatives and, in some instances, its own surveillance operations, according to court and law enforcement records, which include internal Purdue documents, and interviews with current and former employees. The newspaper discusses a burgeoning criminal enterprise in its own territory to show both Purdue’s knowledge of suspect activity involving OxyContin prescriptions, and the horrific results. The Times recounts the case of a doctor, later convicted of felony charges, who was prescribing in one month as many as 73,000 pain-killing pills with a street value estimated by law enforcement officials of $6 million. The suspicious activity centered on scripts for 80-mg Oxycontin pills, a potent dosage favored on the street because it could easily be tampered with to make it easier to take; the firm since has switched and eliminated so-called “80s.” Purdue knew of these and other wild practices, which, the paper says, would lead to “1.1 million [OxyContin] pills [spilling] into the hands of Armenian mobsters, the Crips gang, and other criminals,” before authorities moved in, shut down, and indicted parties involved. Here’s the truly galling part of Purdue’s story: Long after authorities had moved on the criminals, including by obtaining a guilty plea to health care fraud by a corrupt doctor at the heart of the Los Angeles drug ring, the company popped up, and offered to provide voluminous records it had on the wrongdoing. Purdue has sought to hype its post hoc cooperation with authorities as beneficial to the public good, valuable to crime fighting, and evidence of its diligent corporate efforts to crack down on OxyContin abuse. Meantime, the Times also travels 1,000 miles north to report on the havoc wreaked by the flood of illicit OxyContin, trafficked by gangsters from suburban LA into Everett, a once pretty, quiet Washington town. The paper says Everett, due to opioid drug abuse, has been devastated by criminality (with half the crimes in the area tied to prescription drugs); residents also have been saddened by overdose deaths that once were common only to big cities. Let’s see now whether law enforcement officials and regulators step up and follow the information laid out by the Times to inquire, for example, whether Purdue has followed the letter of the law in reporting known criminal drug activities, as it is legally required to do so. As I’ve written before, those in LA and elsewhere who may have suffered harms as a result of Purdue’s plodding response to startling information it held may end up seeking remedy in civil lawsuits. But as Stat, the online health news site, notes, Pfizer is a tiny player in the opioid drug business. And while the company has tried to spin its cooperation as a big deal, experts note that the firm may have self-interest at the fore: It may gain information about competitors’ activities by cooperating with Chicago officials. And Pfizer is working with others to develop and market a new pain killer. It will be touting that product as non-addicting and superior to opioids.